German shipbuilder Lürssen's Project Tatiana has blossomed into Golden Odyssey, a 123 metre yacht said to be owned by Prince Khaled of Saudi Arabia. A video of Golden Odyssey on the quayside at Lemwerder, 10 miles north-west of Bremen, has recently been posted with her name visible to the world. Her two sweeping staircases, first seen in pictures published by Boat International in May, can be seen, complete with teak railings, leading down to the swim platform. There have been few details available about Golden Odyssey as she has been kept under a publicity embargo by Lürssen while in build, but it is thought she has a 20 metre beam, a volume of 7,600 gross tons and an ocean crossing range. Boat International reported in May that the then Project Tatiana had been spotted on the move as she headed out for sea trials and confirmed her LOA as 123.2 metres. Golden Odyssey, as we now know her, was launched in mid-March and soon after moved from her shed at Lürssen’s facility in Lemwerder, Germany into a quay for finishing. Little else is known about Lürssen Yachts' hull No 13689 other than that she is constructed with a steel hull and aluminium superstructure, is said to be designed by Martin Francis, though he has not confirmed this. Her interior is rumoured to be the work of the late Alberto Pinto. 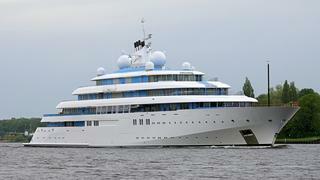 It is the second yacht owned by Prince Khaled to go by the name Golden Odyssey. 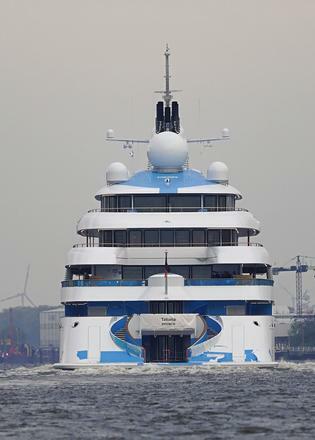 The first, an 80 metre yacht built by another German yard, Blohm+Voss, is listed for sale for $36.3m. This yacht, built in 1990, has spent a significant amount of time cruising around the world in support of the prince’s Living Oceans Foundation, a non-profit organisation dedicated to ocean research. Also underway at Lürssen is the new 112 metre Palo Alto superyacht project, sold by Moran Yacht & Ship. The Andrew Winch-designed yacht is being built for an experienced client who sought a family oriented yacht. Project Alto is scheduled for delivery in spring 2018. Another Andrew Winch project sold by Moran and being built at Lürssen is the 74 metre Project Thor, boasting a huge interior volume. She is due to launch in 2016.